Australia's peak body for the planning industry has announced the winners of the 2015 Australia Award for Urban Design, with Western Australian projects and programs taking two of five main awards. South Australia, Victoria and Queensland also each take an award. 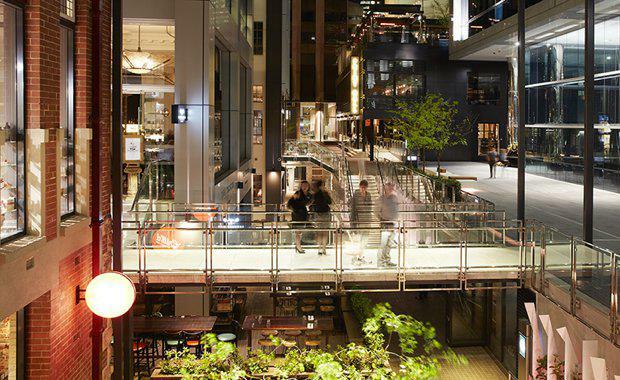 Brookfield Place, an inner-Perth city block takes out the main gong - the award for a large scale delivered outcome. The project transformed a block left vacant for 30 years into an inviting and engaging public realm. Hart’s Mill area in Port Adelaide South Australia takes the award for small scale delivered outcome, and revitalises the wharf surrounds of former milling buildings. A Melbourne-derived potential smartphone app Home:LIFE takes the award for large-scale concept, representing a cutting-edge collaboration between industry and academia, alongside the Sunshine Coast Light Rail plan that wins for large-scale policy, aiming to integrate public transport into linear coastal urban development. Fremantle’s Victoria Quay Enabling Precinct Plan takes the award for small-scale policies, programs and concepts, aiming to unlock the potential of the quay, station and park precincts of Fremantle Port to transform them into commercial destinations. Commendations go to projects and plans in Victoria (4 commendations), and New South Wales (2 commendations). Ms Kirsty Kelly, CEO Planning Institute of Australia says she is most proud of the winning urban designs related to the innovative reuse of spaces for public use, or as is the case with one winner, an innovative web-based planning tool:"Good urban design creates more attractive, enjoyable and vibrant places for people to live, work and play. High quality urban design is important to improve the liveability as density in our cities increases." Ms Kelly says, "The economic contribution of urban design is well documented - quite simply, people prefer to spend more time and money in places that are well designed. These awards recognise a range of places that are adding significant social and economic value to their communities. ""I would like congratulate everyone involved in the projects we celebrate tonight, and thank all those that entered,” Ms Kelly said “By holding the Award each year we remind the community of the critical importance of planning, design and innovation in our ever- changing built environment. "The Australia Award for Urban Design is Australia’s premier award for excellence in urban design and is hosted each year by PIA and supported by the Australian Institute of Architects, the Australian Institute of Landscape Architects, Consult Australia, Green Building Council of Australia, the Urban Design Forum, Engineers Australia and ASBEC. The award was first presented in 1996 after being proposed by the Urban Design Task Force under former Prime Minister Paul Keating.